Leaning to the left without any pain. Thank you very much for your wonderful article on the Pias Sign. I have been to my GP who is known for his skill in fixing back problems; he said I am leaning away from the pain. He sent me to have an MRI and to a neurosurgeon I had the MRI and went to the neurosurgeon. He neuro said that the bulge in discs were not causing the the problem. He said that I had a inflamed joint and prescribed a seven day course of the steroid predisone. Eight 5mg tablets a day and then stop; I nearly lost my life from the withdrawal symptoms. My GP also sent me to a physio for five visits without any improvement. I then went to another Physio who had fixed a tennis elbow for me previously. He found four muscles in spasm and two ligaments strained and he fixed them in four sessions. At no time had I a feeling of pain in my spine or leg. Just a tiredness associated with the ligaments. The photo of the man in your article looks exactly like me and the ligament is where the arrow is. Sorry to be so long winded about this but you are the first to precisely diagnose my problem for which I am truely grateful as it arms me against wrong diagnoses in the future. In the mornings when I get out of bed I am much straighter and I use a stick on my right side to keep myself from leaning to my left. Thanks for the compliments; makes my day! Whatever our theories and disagreements about diagnosis, it would seem that you are getting better; if the pain has gone then the chances are good you will recover completely, or nearly completely. In my book, getting out of the Pisa sign is vital; if you're still crooked then it means that something is still seriously wrong; in my language, probably a disc that's bulging. In your neurosurgeon's opinion the joint is still inflammed. Until you are up straight, I would take life very quietly; spend some time lying down each day, not bending, sitting less and certainly no heavy lifting. 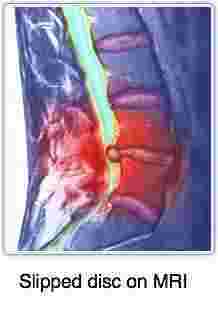 Take a look at our slipped disc synmptoms page; use the search function at Chiropractic Help to find it. What's great is that you have no leg pain; that means Grade I. But did you have pain when coughing, sneezing or straining on the loo? Was sitting difficult? When your doctor, surgeon, therapist lifted your leg, whilst lying flat on your back, did you have back pain. At how many degrees of leg raise? Did the MRI show a bulging disc? Could you type me the report? Keep to this same thread. The body has amazing healing powers; do lots of those gentle back exercises, give it another month before doing crazy things and with luck you'll get better. Look too at the Slump Test; sitting in a kitchen chair, does raising the leg parallel to the ground cause pain in the back? If you don't come up straight, John, and the Slump Test remains positive, I'd consider an opinion from a local chiropractor. I am still having the same problem a year on. Since I last wrote to you I have been to 9 more medical professionals. All were unable to fix my problem or identify what was amiss. Great joy I was able to walk upright for a few days until it wore off. I felt that that proved that the SI joint was hyper-mobile. As a result we tried a cortisone injection into the SI joint that worked for two weeks. We tried a second injection 3 months later and that lasted three weeks. After a long walk I am now as bad as ever. All the muscles and tendons that were in a stressed condition were released leaving just the SI joint ache. I am convinced that the SI joint is the problem but no one knows how to fix it as yet. This is beginning to sound more like the typical SI problem that chiropractors excel with, only perhaps complicated by a short leg. Has anyone checked your leg length? Thank you for your most considered response and helpful comments. I have just seen my eight doctor/physio with no suggestion of the problem. Because,thankfully, I have no pain everyone is confused. I can lift both legs vertically with no pain at any point. I can run up and down a stairs with no pain and it seems to help me stay upright. I have passed the slump test three times with no pain. I can bend sit sleep lie flat do my exercises and all with no pain. At the end of the day I get a tired ache in the left hand muscle over the hip towards the spine. It feels like My left hand Tyre[spare] has a puncture. My last Physio checked all joints in my back for any sign of soreness without success. Thank you for your caring it is much appreciated. No fracture or destructive bone lesion. Conus is intact.Small disc protrusions present centrally at L4-5 and also at L5-S1 disc to a lesser extent. No evidence of canal stenosis.Minor posterior element degenerative changes also noted Minor age related changes of degenerative disease noted only. No fracture or destructive bone lesion identified. What you are doing is wonderful and many thanks. Hope you enjoy my puzzling conundrum, John. Yes, it is puzzling. Ask your PT to check for a leg length deficit; or your spouse. Standing behind you with a hand on each iliac (hip) crest, is there an obvious unleveling? Sometimes then a soft insert inside one shoe may help. I too alas have no other answers, without being able to examine you myself. Keep exercising.